If you’re faced with having to dispose of furniture, you’ll quickly learn that it is quite unenviable position to be in, and, one that doesn’t have a lot of good solutions. While leather and wood can be a bit easier to unload, these are necessarily guarantees. The reason it’s hard to get rid of used furniture is precisely because of what it is–used. That means to people, charities, and second hand consignment shops, it’s worn, stained, gouged, torn, or just in poor functional condition. While furniture can be restored, practically no matter what it is made of, it’s costly to do so. You’ll find comparable pieces elsewhere and pay about the same, even less in some instances, for gently used, “clearance,” or “floor models” than the cost of restoration. What’s more, you’ll discover that just because you’ve moved it to the curb, it won’t magically disappear. Sure, there are scavengers out and about, but just a couple of nights out in the open means it will be wet with morning dew. Then, there’s the matter of pests and animals, which find such pieces attractive, temporary shelters. Forget about the local garbage collection, because most municipalities won’t haul it away. If it’s in really good condition and only slightly used, you might be able to take it to a consignment shop, donate it to a charity, or, sell it online. However, if it’s worn, you’ll be stuck with it, the cost of renting a truck, and the disposal fees. An easy trick for furniture removal is to call a junk hauling service and watch it get carted away without having to lift a finger.Simply give them a call or schedule a time online. Then, take advantage of the service by gathering up any more junk. This can include things like old fitness equipment, old lawn equipment, electronic waste, and a whole lot more. (Basically, all the stuff that requires recycling or other types of disposal. This way, you’ll take care of all of it at one time. Plus, you don’t have to worry about lugging it around town to find the right place or places. And, you’ll dodge those pesky but expensive disposal fees. 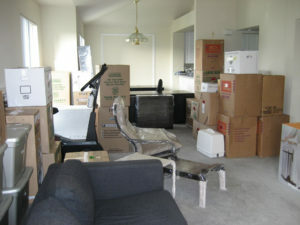 )When you need furniture removal, just phone 800-433-1094 or visit Junk Garbage Removal.